System One is an advanced home communications and entertainment system which can support a master station and a combination of up to 20 room stations and door stations. Features include selective calling to individual room stations or you can make a 'Group Call' to a group of stations, (e.g, all the upstairs stations), or you can page all stations at once. 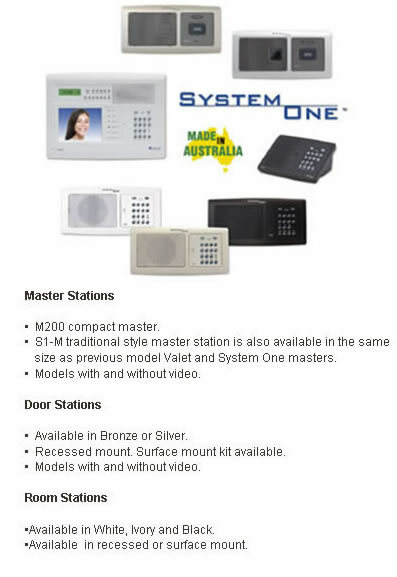 Intercom features also include hands free reply from all stations, children's room monitoring, privacy function, electric door or gate release from any station, switchable keypad backlighting and high quality sound from the built-in speaker. Each station has digital local volume control and a privacy function to prevent unwanted "Listening In" to private conversations. The master station has a built in Digital AM / FM radio with 6 station presets and a digital clock with alarm functions so you can wake up to the great sound of radio at any room station throughout the house. System One can also be used without a master station giving you the same high quality intercom features for room to room communications. Ask us about optional home automation and video features. Control a variety of electrical devices such as lights, spa, garage door and others from any room station. Also ask about optional video monitoring for baby's room, swimming pool or outdoors to enhance personal security.